“You got an opportunity to make a dream become a reality - and when you do, you just got to take advantage of it.”-Eric Thomas. 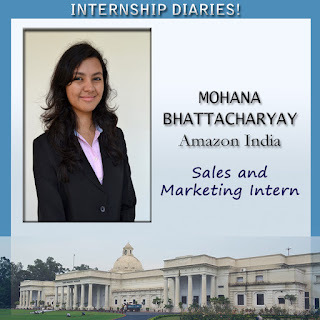 Working in one of the world’s largest brands, my internship at Amazon India was nothing short of a dream come true. The pace of e-Commerce in India has started picking up. With the online buyer penetration being less than 2%, the Indian e-commerce industry is still at a nascent stage. Growing at a CAGR of 34% since 2009, this sector displays a lot of demand-side potential. Amazon India has thousands of sellers listed on the platform and with the growing business volume, it is imperative to launch still more. With increasing number of sellers on-boarded, it is important to find effective and scalable solutions to proactively engage them. My project involved the implementation of a social media engagement program for third party sellers. After exploring several options available to achieve seller-to-Amazon, Amazon-to-seller and seller-to-seller engagement with a qualitative study, supported by data from market research of my target customers, a specific platform was selected. Within two weeks of my internship, a closed pilot with around 400 marketplace sellers was launched that enabled them to interact with each other and with Amazon India in order to understand our processes better, share information, tips, experiences and best practices, and resolve their queries through continuous social engagement. All of this finally added up to the formation of personalized networks amongst the sellers of the Amazon family and ultimately, an enhanced seller experience. With the project, I did not limit myself to seller engagement but also explored social media marketing of seller-facing products and services. Moreover, the platform has the potential to facilitate a faster, smoother and a hassle free “Go-Live” experience for the newly registered sellers by lowering the registration-to-launch time period, and thus, increasing the launch efficiency. To tangibly test the outcomes from the pilot, I also developed a number of metrics that would help measure the effectiveness of the platform and quantify the same in terms of the desired results. At Amazon, our vision is to be Earth's most customer centric company and the results of the pilot suggested that the proposed platform, with close and careful monitoring has the potential for driving value for our customers. The best part of this internship project was that I got to interact with all the seller-facing teams starting from business development to account management to logistics, product development, online and offline marketing and even mobile app development. The extremely flexible work culture, the open door policy and the grandeur of the country head-office in the premises of the World Trade Center, Bangalore, left me absolutely mesmerized. Despite being the largest online retailer of the world, Amazon India still functions like a start-up. It is still “Day 1” and there is relentless focus on using our investments in technology and innovation to transform the lives of our customers, our sellers and all our partners. From a summer internship, I couldn’t have asked for more!